The numbered cube seating comes in ten cushions numbered 0-9. The tops are multi coloured with an individual number, so as well as seating the cushions can be used as an educational toy. 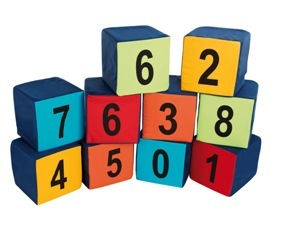 Made from Lightweight foam they are ideal for pre school children, play areas and nurseries. The fabric is showerproof to give a wipe clean finish.